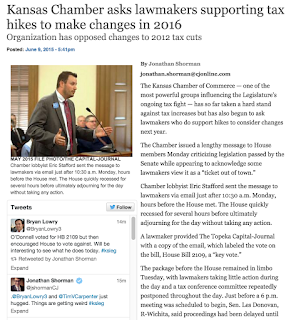 The record-long 2015 Kansas legislative session ended with a record-breaking tax increase. There’s no more potent illustration of the failure of the 2012 tax policy changes than to see 21 Senators and 63 Representatives — including many staunch anti-tax lawmakers — vote for new taxes while attempting to halt a budget crisis brought on by falling revenue. Trouble is, even after pairing the just-passed tax increase with cut-back expenses, Kansas still hangs on financially by the fingernails. Lawmakers began the legislative session with a very conservative set of expenses tallying to $6.5 billion, offset by estimated revenue of $5.7 billion — a gap of almost $800 million. In the end they pulled expenses down about $150 million, voted to raise almost $400 million in revenue, and filled the remaining gap with transfers from the highway fund and other funds. 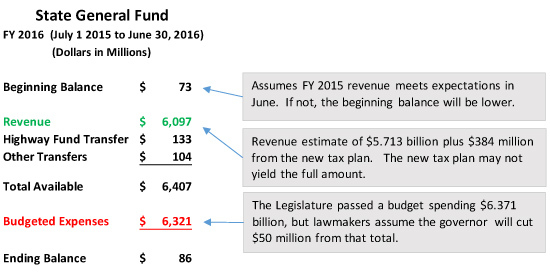 As a result, the Kansas general fund remains structurally unbalanced with a FY 2016 income stream of $6.1 billion against expenses of over $6.3 billion. Expenses were lowered from $6.5 billion mostly by increasing the state’s “managed care privilege fee.” The fee, charged to managed care organizations and insurance companies, will likely make health insurance premiums go up for some Kansans, but the proceeds from the fee can be used to draw down additional federal dollars to lower the Kansas share of Medicaid expenses. Plus, the expense budget of $6.321 billion counts on the governor cutting another $50 million out of programs — something he has not done yet. The various components of the revenue plan tally to a $384 million tax increase in FY 2016, but not all of that revenue may materialize. FY 2016 begins July 1. It will be difficult to implement the sales tax hike quickly enough to get all of the expected revenue from that source in the next fiscal year. An income tax on “guaranteed payments” expected to generate $24 million can easily be avoided by potential taxpayers, and a $30 million “tax amnesty” provision may be overestimated. 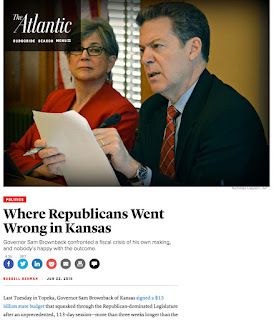 Kansas now has an expense budget that has public schools clamped down under block grants, many other programs constricted, state employees without even a cost-of-living raise in years, and another $50 million in cuts to be named later. But even that conservative budget does not balance without transfers from other funds, mostly the highway fund. What if revenue does not meet expectations? What if Kansas courts rule that Kansas is shorting funds for public schools? What happens when we reach the next recession? Kansas has no financial flexibility to meet these situations, let alone invest in the future. We are hanging on by our fingernails. — This column originally ran June 17 on the Kansas Center for Economic Growth website.